Speaking of neighbourhoods... 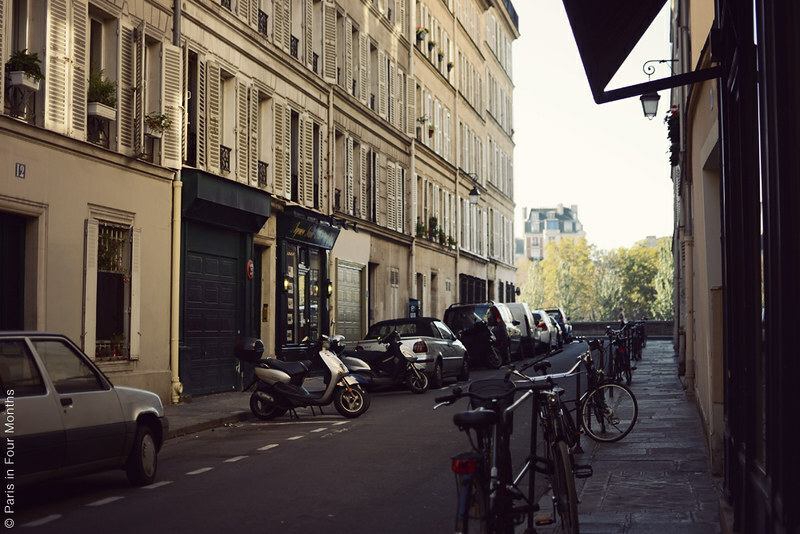 This photo is from where I used to live in Paris. Well, I didn't live on this exact street but very close by. I both loved and (mildly) hated my former neighbourhood. I hated it because it could be so damn crowded sometimes which was especially annoying when I had to lug four very heavy grocery bags all the way home while zigzagging between all the tourists who stopped in the middle of the street to take photos of a pigeon for example (I shouldn't throw stone in glass houses, but whatever). And I loved it because of... Well, everything else. The lovely people, the cheese shop along the main road, my very kind butcher, the cute little paper shop downstairs, the amazing evenings that I spent overlooking the Seine, the calmness, that safe feeling that the island provided, the early mornings, the walks over the Seine and the fact that it felt like I lived in a small village even though I was in the middle of Paris. Amazing!